Dr. Cynthia Nowicki Hnatiuk Honored on her Retirement from Anthony J. Jannetti, Inc.
Home > Dr. Cynthia Nowicki Hnatiuk Honored on her Retirement from Anthony J. Jannetti, Inc.
Pitman, NJ – Nurse leader and executive Cynthia Nowicki Hnatiuk, EdD, RN, CAE, FAAN, of Westampton, NJ, was honored recently by Anthony J. Jannetti, Founder and Chairman of Anthony J. Jannetti, Inc. (AJJ) , for her 23 years of service to the company and for her dedication to the nursing profession. To recognize her outstanding contributions to nursing specialty organizations and business leadership, Jannetti awarded her a "Brooke" sculpture by artist Tom Bennett. Initially presented by Jannetti in 1989 to Paul Newman for his work with pediatric cancer patients through the Hole in the Wall camp, this sculpture has been awarded to many individuals who have made meaningful contributions to advance the care, health and well-being of pediatric patients. Other noted recipients include Marian Wright Edelman and Roslynn Carter. During her tenure at AJJ, Dr. Hnatiuk worked as Vice President of Organizational Development and most recently served as the CEO of the American Academy of Ambulatory Care Nursing, the Academy of Medical-Surgical Nurses and the Medical-Surgical Nursing Certification Board. She retired on June 29. Throughout her career, Dr. Hnatiuk worked on the local, regional and national levels to promote the value of nursing specialty organizations and nursing certification. She guided many of AJJ's nursing clients, helping them innovate services, expand education and increase membership. In 2013, Dr. Hnatiuk was inducted as a Fellow of the American Academy of Nursing. This fellowship is awarded to the most esteemed nursing leaders to acknowledge the extraordinary contributions to nursing and health care made by the individual. She has been recognized by many nursing organizations for her leadership and guidance. Dr. Hnatiuk is a member of the American Society of Association Executives and is a Certified Association Executive (CAE). She is a past president of the American Society of Plastic Surgical Nurses and the Plastic Surgical Nursing Certification Board. “Cyndee has been a valuable member of our team for 23 years. Her leadership and professionalism are exemplary. We wish her well in her retirement. Our prayers and good wishes go with her,” Jannetti said. 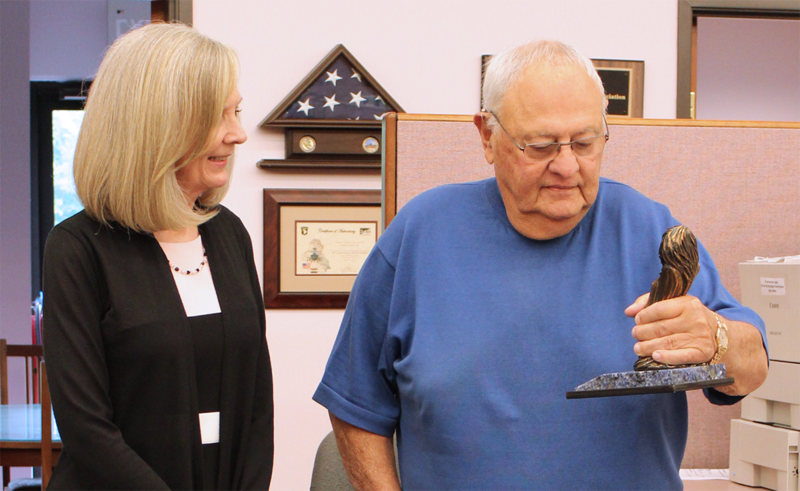 Image: Dr. Hnatiuk receives a Brooke sculpture from Anthony Jannetti during her retirement ceremony.